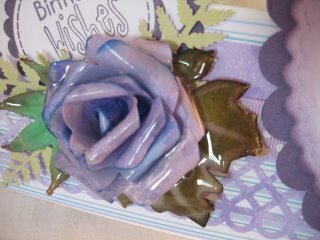 It is so nice to see the weather brightening up, and now that the clocks have changed there is more time to do some cardmaking. I made my usual trip to Harrogate in March to the Great Northern Papercraft Extravaganza (GNPE) and it was, as always, fabulous. Needless to say I spent a fortune but I got many items that I have been saving for over the year. One of my purchases was the Big Shot Pro. It has a larger cutting platform than the Big Shot, which means I can get the Spellbinders Grand Dies ....another item I have covetted for a long time and now eventually bought...again from the GNPE. Got to go easy on the old bank balance for some time now and save again, ready for the next show. I have been busy over the last few weeks and the result of all that activity is to add some new features to the website. They are a wonderful addition to your cards and they can look almost lifelike. They are very easy to make, and I show you how to create your own template to make them. Keep it safe for the future, and any other roses that you may wish to make. You can also take it one step further by dipping them into clear embossing powder. This will create a glass like appearence, and the result is spectacular. This tutorial will show you how to achieve this result. Another addition is the delicate Organza flowers. They give a vey feminine feel to your designs and again they are easy to make. 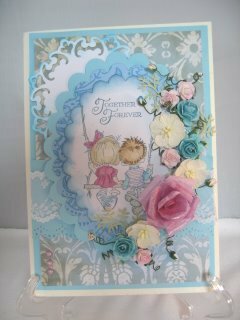 If you are anything like me then you will love the addtion of flowers and "bling" to your cards. Not every body wants this look though,and there are some techniques that are more suitable for this. So I have also added several new ones, that are just as easy to do. Try going for a leather look or maybe a tile effect. These maybe more fitting for a male themed card, and you will find them in Cardmaking Tutorials. I have added lots of variations to one particular card on the website, and because of many requests I am also going to add video tutorials for all the variations on the Easel Cards. I know many people prefer to learn by watching a technique being done, and this is they way I enjoy learning too. It seems much easier to me once I have been shown the way to do something. So these short videos are just for you. And because of extra time on YouTube I am now incorporating the making of a card into the video. I hope you enjoy them. 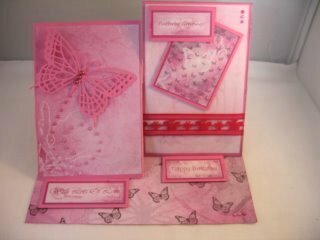 Card Making Magic was two years old in March and it continues to go from strength to strength. I hope it has the same success over the next two. I couldn't have done it with out all the lovely people that continue to visit every day and write to tell me how much they enjoy it. The Sitemap continues to show you every page that is on the website. And all the new pages are added each time one is written. They are all listed to help you find your way around. The search box will also help if there is something you particularly want. Just type your keyword into the box and you will be magically transported to that page. So I say thank you to every one for all your continued support and for the lovely emails I get from you. As always it is lovely to hear from you and I will always respond to those emails. I hope you will come back and visit often and continue to enjoy my website....it is created just for you.